Build your own mini golf course indoors with items found in the kitchen, playroom, garage or local home building supply store, toy store and house wares store. These holes are not set up permanently. Move the pieces from one playing area to another as needed. Use a piece of flexible accordion style piping. Take a golf ball with you to the garage or hardware store to make sure it will fit easily into the pipes. It needs to be large enough for a golf ball to enter and move through without catching. Use longer pieces and bend them so the ball will roll through the tube and change direction. Cut a piece of cardboard 2” to 3” wide from cardboard that is thin enough to roll into a tube shape. The tube will fit inside of an adult sized tube sock. Staple or glue the cardboard tube inside the top of the tube sock to keep the sock open. Put the sock on the floor so the ball can go into the cardboard framed opening. Cut the top off recycled tin or aluminum cans that are wide enough to for the ball to enter the can. Use a can opener that cuts the lids off without a sharp edge. If you do not have that style of opener use heavy duct tape to cover the sharp edge of the can. Wash and dry every can thoroughly. Put the cans on their sides on the ground to use as holes. Use different sized cardboard boxes to create a variety of holes. Shoe boxes, moving boxes and heavy cardboard packing boxes work well. Turn the boxes upside down. Cut holes in the sides of the boxes so they look like an arched mouse holes. Use big scissors or a cutting blade to cut through the heavy cardboard. Make the holes different heights and widths to create more of a challenge during play. Use wooden or plastic building blocks of any size. Blocks that snap together are sturdier but wooden blocks that sit on each other may be more challenging to keep from knocking down while the golf ball is in play. Create a building with open doorways and arches as holes. Build some of the openings at an angle or create a tunnel in front of the hole. Make the hole more difficult to get to with added obstacles, barricades and guide rails made from the blocks. 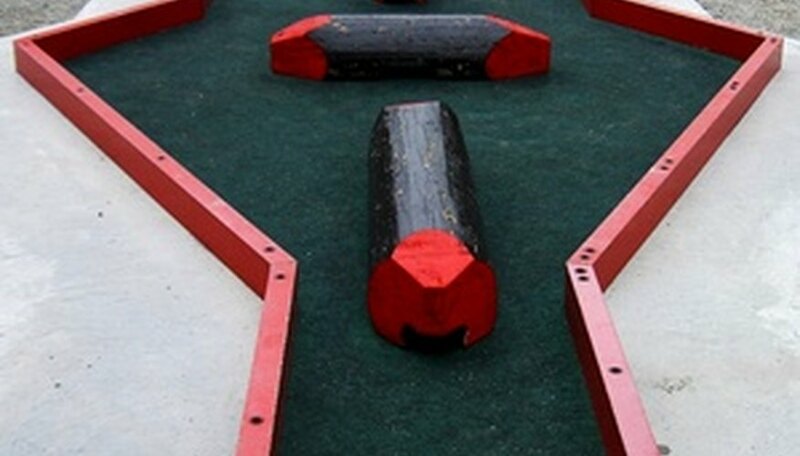 The added obstacles force the players to negotiate the traps and use the barricades or guide rails to sink the hole.